What does “and for other purposes” mean in legislation? We at POPVOX get lots of questions! About POPVOX, about startups.. but mostly about Congress and the legislative process. Our team loves hearing from users. One of the most frequent questions we get is: "What does it mean when a bill says "and for other purposes?" Q: "and for other purposes." This phrase scares the  out of me. Yet is seems to be embedded in all bills I look at. I have yet to find out what any of these purposes are. It's almost like having to vote for it before we find out what's in it. 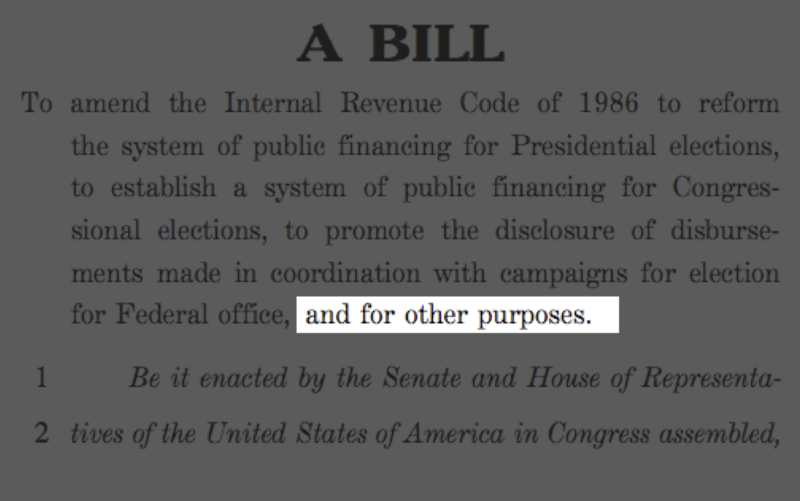 "For other purposes" appears in a lot of bill titles. It's not a bait-and-switch. It simply means that not all of the information about the bill can fit into the title, but if you want to know what is in the bill, just read the language. It does not create an open-ended law — it is simply a way to shorten the title or description of what the bill does. It just means that all of the elements of the bill cannot be included in the title, but any "purposes" the title alludes to will be in the bill language. As described in the House Legislative Counsel's Manual on Drafting Style, "if the bill covers multiple items, 'and other purposes' may be used at the end of the title instead of describing each item." (p. 25). More questions? Please add them in the comments or email info@popvox.com. To end the practice of including more than one subject in a single bill by requiring that each bill enacted by Congress be limited to only one subject, and for other purposes.